Juggling John is a children's birthday party entertainer for Hertfordshire, a children's party magician and birthday party clown, a juggler, jester and more. Hertfordshire children's entertainer Juggling John provides a variety of different shows and performance styles tailored for different age groups. 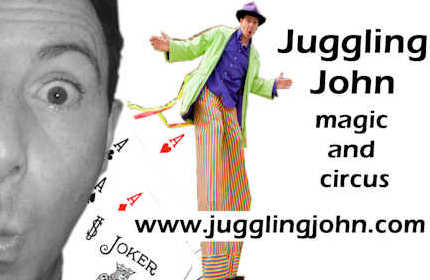 As a children's entertainer Juggling John brings juggling, magic, clown and circus to your children's birthday party or event. He is fully police checked and insured and is a member of Equity. Because of his huge experience of children's parties there is very little that Juggling John has not come across in terms of children's birthday party guests. He is thus able to to tailor each show to the right level for your particular age group. He is also particularly adept at performing to a multi-generational crowd at events such as street parties, church fetes, school fairs, big family celebration parties and the like. He is an all-round entertainer! Juggling John knows this area well - he works regulary as a children's entertainer in Hertfordshire. 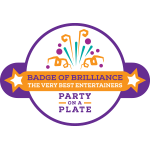 He is familiar with the roads and many of the popular children's birthday party venues in Hertfordshire and will always be in good time to set up and be ready for your children's party.